Vitamin B 1 100 mg.
Tablets:Saccharine sodium, PVP 1>. :25, vanillin, lactose, magnesium stearate, stearic acid, Talc, maize starch, PEG 6000, gelatin, ethyl alcohol. 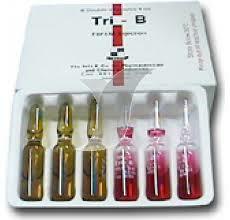 Tri – B ampoules contain three factors of vitamin B complex BI, 86, Bl2 which are essential for the performance of the normal metabolism and proper functioning of the living cells. Vitamin 8t forms the co-enzymE.’ eo-carboxylase which catalyses the decarboxylation of pyruvic acid and other keto-acids. Vitamin 86 is a constituent of the enzyme system which is concerned with transamination and decarboxylation of amino-acids. Vitamin 812 in addition to its haematinic and anabolic functions fulfils an important role in the treatment of neurological disorders. Tri-R tablets, in addition to vitamins BI, B6, B12 , contain folic acid which is necessary for the normal production of red blood cells including maturation of mcgatobtasts into normoblasts. excreted in urine and small amounts from bile. -After oral administration, it’s ahsorbed from GIT, metabolized and stored in liver and excreted in urine. 1- Painful neuropathies ,Trigeminal neuralgia, rheumatic pains. 2- Polyneuritis, Optic neuritis, Diabetic neuritis, Alcoholic neuritis. 5- Neuromuscular disorders, Tremors, Cramps. 6- Anaemia: nutritional macrocytic anaemia, megaloblastic anaemia of infancy, anaemia of pregnancy, pellagra and following gastrectomy and in pernicious anaemia. Injection: – The contents of the ampoules 1 and 2 are mixed and injected intramuscularly daily or as directed by the physician. Tablets : 1- 2 tablets daily or as directed by the physician. 2-Pattents with known sensitivity to any of the components. 3-Pregnancv ,Nursing mothers &Pediatric use.Do not administer injections preserved with benzyl alcohol to nconates, infants below 13 years, pregnant women or nursing mothers. Benzyl alcohol has been associated with serious adverse eventse; death, particularly in pedtatrtc yatients ( it may cause Gasping syndrome ).Injections preservative free should be used in these populations. Parenteral administration of thiamine hydrochloride solutions may cause allergic reactions. – Colchicine may interfere with vitamin BI2 absorption leading to megaloblastic anaemia. – Reduced absorption of vttamin Bl2 was observed in case of patients receiving potassium citrate or calcium gtuccnare with metfurmin. – Biochemical interactions occur between pyridoxal phosphate and certain drugs as Isoniazid (increase urinary excretion of vitamin B6) Penicillumine (prolonged use), cycloserine and hydralazine. – Vitamin B6 enhances peripheral decarboxylation of levodopa and reduces its effectiveness thus must be avoided in patients receiving levodopa. – The effect of folic acid may be diminished in patients receiving barbiturates, and ce- trtmoxazcle. – Sulphasalazine can Impair the absorption of folie acid in the gut. – Used if clearly needed in pregnancy. – Vitamin B complex excreted in breast milk, so caution should be taken during lactation. -Tri-B ampoule contains beuzyl alcohol which is potentially toxic when administered locally to neural tissue and is contraindicated for use in premature infants because the formulation contains benzyl alcohol. -Box of 6 double ampoules. -Box of 3 double ampoules. -Box of 2 strips x to tablets. -Storc in a dry place away from light. – Store at temperature not exceeding 25<>C. Chemical Industries – Cairo – A.R.E. R.C.C.